» GOD’S-EYE VIEW OF YOU! You are here: Home » » Title: GOD’S-EYE VIEW OF YOU! Fujiko Takai Signs, CSB — Our speaker comes from Tokyo, Japan and has a family, husband and two daughters working in the US. She is a student, practitioner, and teacher of Christian Science. She studies the relationship between prayer and healing, consciousness and reality, spirituality and wellbeing. Her job is to find out how we can free ourselves from various limitations. 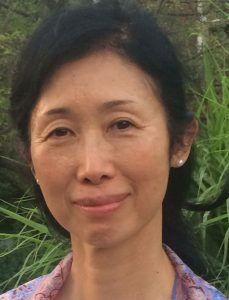 While her husband’s job took Fujiko across the United States, she worked as a market research consultant for computer manufacturing companies and taught Japanese language and literature at community colleges and universities. She also taught dance to children. In her mid-thirties, Fujiko fell ill and sought healing through different treatments, but none of them gave her a lasting cure. One day, to her surprise, she found that the healing of Christ Jesus was possible now and learnable. As soon as she started reading about this system of healing in Science and Health with Key to the Scriptures by Mary Baker Eddy, a respected American healer and religious leader, she was relieved from various symptoms that had limited her before. As she studied and learned more about Christian Science, she witnessed many healings within her family and circle of friends and eventually received requests to assist others with prayer.